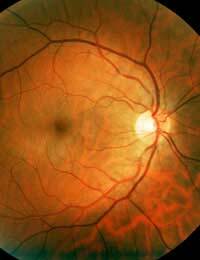 Home > Ask Our Experts > Does an Optic Nerve Grow? Q.My grandaughter just had an MRI (19 mths old) and we were told that she had a small optic nerve, some Fluid on the brain and a condition called GA1. My grandaughter was tested for this a birth with a blood test and it was negative and you don't develop this later. We know she has vision low and to the sides low but she has none in front. She is a very bright active child. She is talking like there is no tomorrow, she sings, she is picking new words up daily and always has an answer. She can crawl a little and walks with aid. She went to take a step tonight and thinking of it later, she went down because this is where her vision is The pediatrician said not to put to much into the GA1 thing because she is so bright and active. We send urine samples in Monday and she see a specialist on the 18th. Does an optic nerve grow at all? She does not have an involuntary eye problem and is normal to look at, other than this she keeps her head down alot; however, I feel this is because of her low vision. Your granddaughter sounds like quite a character! From what you have told us about your granddaughter being bright and active, with no visible signs of physical problems, it would seem likely that she has a very mild form of GA1. GA1 stands for glutaric aciduria type 1. This is an inherited metabolic disorder that comes in a wide variety of levels of seriousness, with those at a low level, such as your granddaughter, with little or no outward physical signs of the disorder, but with some internal issues. GA1 can manifest itself in a more acute manner, with typical physical signs being very large heads and sight difficulties. It is a condition which affects around 1 in 100,000 new borns. As in inherited disorder, GA1 must be present in both parents, so it is not a disorder that can be, perhaps painfully, attributed to one parent. In recent years, doctors have largely considered GA1 a treatable condition, with approved maintenance diets and recommended supplements. It is worth you gaining a detailed report from your specialist in order to understand what measures you and your family can take to help minimise the development and impact of the GA1 on your granddaughter. The characteristics of GA1 are that the body is unable to break down certain acids, causing a build up of these acids. When the acids accumulate, they can cause damage to the brain and the regulation of movement. This is why it is characteristic for GA1 sufferers to have difficulty moving gracefully or purposefully, which can be embarrassing. In answer to your particular question about whether or not an optic nerve can grow and the implications of this for your granddaughter’s case, it is not terribly clear cut. While the correct biological answer is, unfortunately, no, there have been some revolutionary developments. Optic nerves do not grow as they have proteins in their outer layer that are ‘programmed’ to not allow regrowth, so when they are damaged, or not properly formed, that is final. However, in 2004, Harvard Medical School scientists developed the ability to regrow optic nerves, so there is considerable chance that this will progress.